G.P. Putnam's Sons Books for Young Readers, 9781101996485, 288pp. 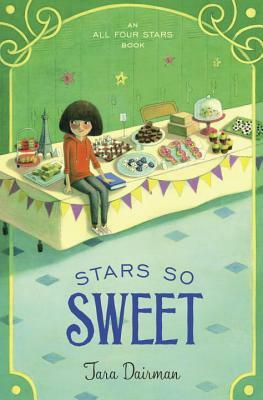 Joan Bauer meets Ruth Reichl in this charming middle grade foodie series. As the summer winds down and Gladys Gatsby prepares to start middle school, she is nervous about juggling schoolwork and looming deadlines from her secret job as the New York Standard’s youngest restaurant critic. When her editor pushes for a face-to-face meeting to discuss more opportunities with the paper, Gladys knows she must finally come clean to her parents. But her perfectly planned reveal is put on hold when her parents arrive home with a surprise: her Aunt Lydia, one of the only adults who knows her secret, fresh off the plane from Paris. Gladys and Aunt Lydia try one last ruse to fool her editor at the Standard, but even with her aunt’s help, Gladys just can’t manage the drama of middle school and a secret life. It’s time for Gladys to be true to herself and honest with her friends and family, regardless of what those around her think. Tara Dairman is the author of All Four Stars and its sequel, The Stars of Summer, as well as a playwright and recovering world traveler. She grew up in New York and received a B.A. in Creative Writing from Dartmouth College. After surviving the world’s longest honeymoon (two years, seventy-four countries! ), she now lives with her husband in Colorado. Visit her online at www.taradairman.com or @TaraDairman on Twitter.